What is the RBS Calculator? The RBS Calculator is a biophysical model that predicts translation initiation rate (TIR) for each start codon in an mRNA sequence. It can also design ideal ribosome binding sites to control a mRNA’s translation initiation rate, and thus control protein expression. How does the RBS Calculator work? The RBS Calculator uses the statistical thermodynamic model to determine how well a specific ribosome will bind to mRNA. The model takes into account several molecular interactions that affect translation initiation rate, including hybridization between the mRNA and ribosomal RNA, the formation of inhibitory mRNA structures both inside the 5’ UTR and protein coding sequence, hybridization between the tRNA and start codon, stretching or compression of the ribosome due to a non-optimal distance between the start codon and ribosomal RNA binding site, and interactions between the ribosomal platform domain and the mRNA’s standby site region. How accurate is the RBS Calculator? On average, a designed RBS sequence will achieve a targeted translation initiation rate to within a factor of 2.3 over a range of 100,000-fold. How do I use the RBS Calculator in order to optimize a genetic system? When used in reverse engineering mode, the RBS Calculator can predict the translation initiation rate for each start codon in a bacterial mRNA sequence. 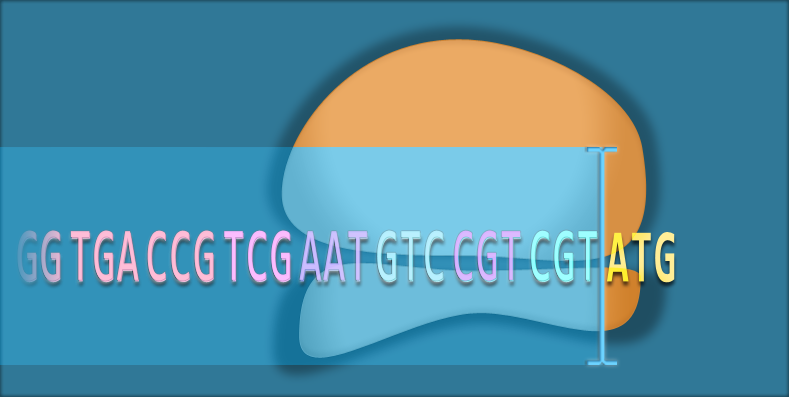 This information enables users to find the correct start codons of open reading frames, estimate the expression levels of protein within an operon, and identify internal start codons that exhibit significant translation and produce variant proteins. When used in forward engineering mode, new ribosome binding site sequences can be designed to increase or decrease a mRNA’s translation rate by a desired factor with a proportional effect on the protein’s expression levels. The RBS Calculator has been used to engineer and optimize the expression levels of recombinant proteins, the productivity of heterologous metabolic pathways, and the performance of genetic circuits. Is the RBS Calculator suitable for all organisms? Currently, the RBS Calculator is only applicable for prokaryotic organisms. What other things may be done using the RBS Calculator? The RBS Calculator may be used to annotate translated Open Reading Frames by identifying start codons that have higher translation initiation rates, compared to surrounding ORFs. How did you come up with the RBS Calculator? According to Professor Salis, if you buy him a beer, he will tell you the story. How was the accuracy of the RBS Calculator verified? The biophysical model was validated studying 624 RBS sequences with varying coding sequences, Shine-Dalgarno sequences, standby site regions, spacer region lengths, and different types of secondary structure. The translation rate was measured for all of these RBS sequences in different context, and the measurements of protein expression were compared to the predicted translation initiation rates. They found the expected linear relationship between the prediction and the measurements, which indicates the ability to predict and control translation rates. What does translation initiation rate mean? Translation is the second step of the Central Dogma of Molecular Biology in which ribosomes bind to an mRNA sequence and produce a corresponding protein. Translation initiation rate controls how many ribosomes can begin and complete the elongation process, which in turn determines the rate of protein production. Why does the RBS Calculator's predictions use a relative scale? The mRNA’s sequence controls the probability that the ribosome will bind to it, but not the absolute rate of protein synthesis. The rate of protein synthesis is also controlled by external and environmental factors, including the number of free ribosomes, the amount of charged tRNAs, and the growth rate of the host. In turn, these variables are highly dependent on the culture media and growth conditions. How do RBS constraints work? You may instruct the optimization algorithm to insert specific, desired sequences into the ribosome binding site sequence. These are called sequence constraints. For example, if you would like to introduce the XbaI restriction site into the beginning of a ribosome binding site, followed by 14 nucleotides that are optimized by the algorithm, then the sequence constraint will be TCTAGANNNNNNNNNNNNNN. Is the RBS Calculator valid for experiments conducted at temperatures other than 37 degrees? Yes, the Salis lab has experimentally validated the model’s predictions at temperatures between 20 to 37C. Overall, the relative translation initiation rates do not significantly change, comparing one mRNA sequence to another. Certain mRNA sequences are more sensitive to temperature changes, due to the exposure of RNAse binding sites or to changes in the rigidity of double-stranded RNA regions. Can the RBS Calculator be used to predict the optimal pathway productivity with varying RBS strength for different genes? Yes, the RBS Calculator may be used to systematically vary a pathway’s enzyme expression levels with the objective of maximizing the pathway’s productivity. To carry out this procedure efficiently, usage of the RBS Library Calculator algorithm is recommended. Can the RBS Calculator be used to design riboswitches? A Riboswitch Calculator has been developed, but not yet released. It uses the RBS Calculator’s free energy model to calculate a riboswitch’s ribosome-mRNA-ligand interactions. Here's a a more detailed explanation of the RBS Calculator.